Gusto, aka Whiperwill Gusto, is a handsome, 3½-year-old white and brindle male born May 25, 2004. His sire is Kiowa Sweet Trey and his dam is Winks Whiperwill, making his grand sire Molotov. 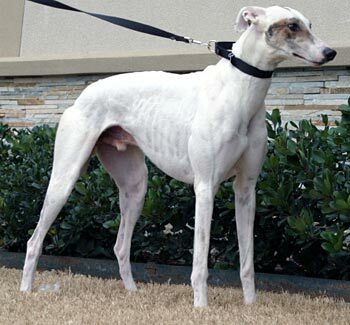 Gusto began his racing career at Valley Race Park in Harlingen on March 2, 2006, moving to Dubuque in Iowa, and then finishing on December 29, 2007, at VRP with a severe tear of his gracillis muscle (extends the hip and hock joints) in his right leg. Gusto did not have to have surgery, but had 6 weeks of very limited activity. His muscle has repaired now, and he is ready to find his forever home! 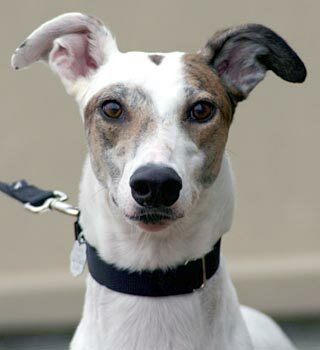 Gusto is small dog tolerant and will tested with cats soon. 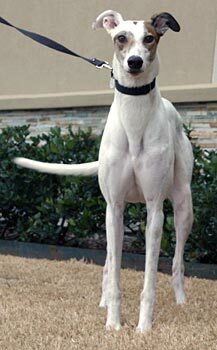 Since Gusto's muscle has healed, he has been moved from his temporary foster home in Oklahoma back to the Dallas area. We have had Gusto as a foster for only a short time, but after the first night of exploring his new territory and sniffing his housemate, Cindy, he has settled in quite nicely. The second night after we brought him to the house, he greeted me just like Cindy always does, with dances and leaps and oh, so much excitement! He's an exceptionally loving Greyhound. He loves to lean against you (and with his considerable size, sometimes maneuvering around all that love is a little difficult!) and he will put his head on your lap and beg for rubs. He loves "walkies" and sharing his space with humans he trusts. He is totally housetrained (the one accident was our fault - he hadn't yet learned to use the doggy door and wanted out - but we didn't respond in time), well behaved, and totally comfortable in a human environment. We have never heard him bark, he does not dig, and he does really well in a fenced backyard. We have SOOOOO enjoyed having him in the household for what seems to be forever (even though it's only been a few weeks).